Earlier this month, I traveled outside the States for the first time to visit Cozumel, Mexico. While the weeklong trip proved to be a memorable experience, I have to say that there was no way that I would have gotten through my vacation without the help from my handy-dandy mini travel booklet. I say this largely because I can barely speak Spanish (even though I took beginner’s Spanish twice in high school and once in college). Unfortunately, this design project didn’t come to me on it’s own. I give most of the credit to my document design professor, Fred Carpenter. Back in February, Professor Carpenter challenged students to design a document that presented “ information in an efficient and effective way.” The only stipulation for the design project was that the document could only be the size of a standard business card or at the most, an index card. 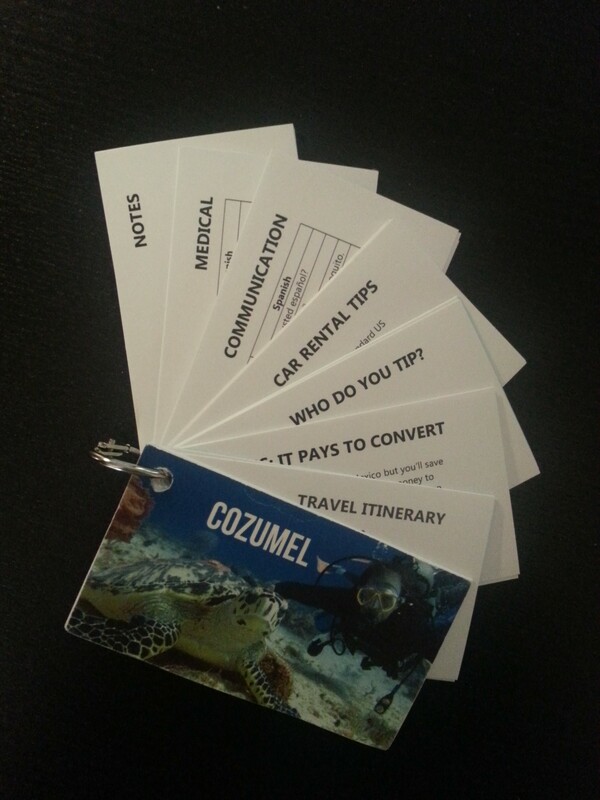 Since I was already spending what free time I had researching my trip to Cozumel, I thought I could kill two birds with one stone and concentrate my information design project around a customized travel book. My decision to create a travel booklet was solidified when numerous travel review sites recommended that tourist carry crossbody bags. I figured out that the travel booklet would fit neatly into my crossbody purse and be accessible easily through an interior pocket. For reconstruction purposes, my travel booklet was created in Publisher using standard business card page size (3 1/2 x 2″) with .25″ margins. Instead of relying on a paper cutter to cut all the pages neatly, I printed the booklet pages on Avery business card sheets with clean edges. Afterwards, I used a single hole puncher to punch holes in the upper left hand corner of each card and secured the booklet with an 1″ individual metal ring binder.